A warm welcome to Janneke Hoogland! 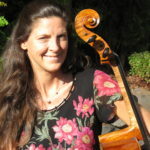 Originally from the Bay Area, she studied cello at the San Francisco Conservatory of Music with Irene Sharp before earning a Master of Music degree from the Eastman School of Music in Rochester, NY. After more than 20 years of study, teaching and performing full time in Rochester, she recently relocated to Carmel Valley. We are so fortunate to have her join the Monterey/Carmel musical community!